Instead of seeing stars, an electrician who experienced a 14,000-volt electric shock to the left shoulder came away with star-shaped cataracts stamped on both eyes, doctors reported Jan. 23 in the New England Journal of Medicine. A cataract is a clouding of the eye's lens, which is a structure that helps focus light or an image. When the lens is clear, light passes through to the eye’s retina -- a tissue located at the back of the eye -- where the brain processes the image. If the lens is cloudy due to cataracts, the result is blurry vision. The male patient, 42, underwent cataract extraction surgery four months after the electric shock, and also had an implant placed in to act like a lens and focus light, what’s called in intraocular lens. It improved his vision a bit, but he was still legally blind and could only count fingers out of his left eye. He likely won’t fully regain his sight because of damage to the retina and optic nerve, the structure that transmits visual signals from the retina to the brain. New York City-based optometrist Dr. Justin Rapp, who had no involvement in the man’s case, explained to CBS News the electrical current may have disrupted the chemical balance in the man's blood, which in turn decreased blood flow to the optic nerves and parts of the retina, as evidenced by the whitish cloud structures seen in the bottom half of the above photos. 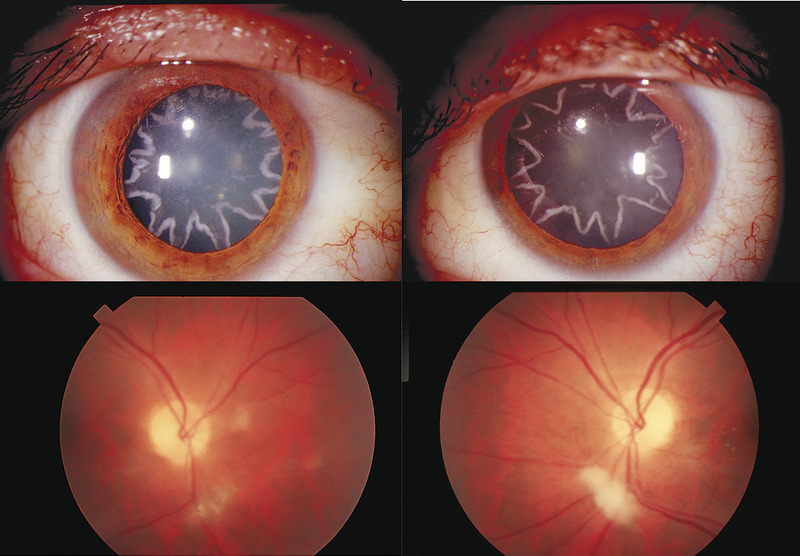 Often, cataracts have been known to form snowflake or star-shaped patterns, Rapp pointed out, but he’s never quite seen a case like this.